Since 2008 Abgefahren e.V.organizes the German Hitchhiking Championships. From a city in Germany the participants race hitchhike in teams of two to a destination onknown until the race starts. Meanwhile the event is a certain date for hitchhikers from all over Germany. In addition the race offers first-time hitchhikers a good opportunity for their start as a hitchhiker. All information about the next event and background about the past races are available at the project microsite Race. Who knows if the next race begins in your city?! The Hitchhiking Cache is a travelling Geocache which is handed on from hitchhiker to hitchhiker. Project page: Trampcache. In 2012 Thomas Weber, a member of Abgefahren e.V., has collected the stories of hitchhikers from all over the world and published them as a pocketbook. Dieses Buch soll Lust machen auf mehr. Trampen, das ist kein staubiges Buch. Trampen, das ist der Wind, der einem um die Nase weht und die Wangen rötet während man an der einsamen Straße auf ein Auto wartet. Trampen, das ist Kultur-, Länder- und Heimatkunde. Trampen ist nicht umsonst sondern kostenlos. Trampen ist nicht gefährlicher als ein Spaziergang im Park. Trampen ist nicht frei sondern libre. Trampen, das ist ein ganz besonderes Lebensgefühl, das man nur erleben kann, wenn man sich traut gegen das Gewohnte zu verstoßen, wenn man offen für Neues ist. In diesem Sinne: Damen raus! Auf geht’s! Lesen kannst du auch unterwegs. The ook is available in German language. It has 180 pages, contains 32 stories and costs 11 Euros. After cost-recovery the revenue goes to charitable organizations. The book is available at Amazon as hardcover and eBook. Since 2007 members of Abgefahren e.V. get involved with installation, maintenance and operation of databases for hitchhikers containing hitchhiking spots. Hitchbase.com is a starting point for hitchhikers to be fast on the roads of the world. Hitchhikers can find all information necessary to receive good hitchhiking spots there. Hitchhikers can share their knowledge and add spots to the database as well as comments and reviews for existing spots. Hitchwiki.org is a collaborative website for collection of information about hitchhiking and other convenient transport opportunities. 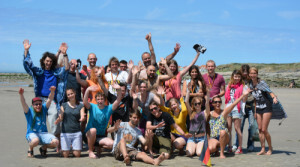 At the multilingual website besides hitchhiking spot databases there is information about long distance hitchhiking, an interactive map and many more tips. Especially the German version of the wiki is maintained by members of Abgefahren e.V..
Abgefahren e.V. 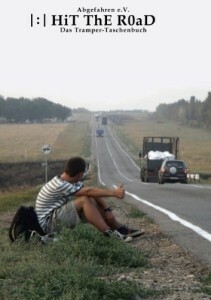 aims to introduce official hitchhiking spots in Germany modeled on the Dutch Liftershalte. 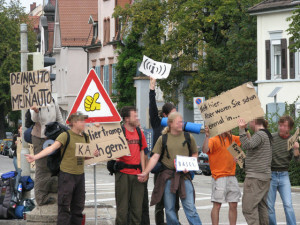 In Kiel, Freiburg and Potsdam campaigns were performed to introduce the idea. Official hitchhiking spots as already existing in different countries make hitchhiking significantly more safe for drivers and hitchhikers and grant more acceptance to hitchhiking.